Skinny Greek Yogurt Broccoli Salad - Easy, Fresh, & Lightened Up! 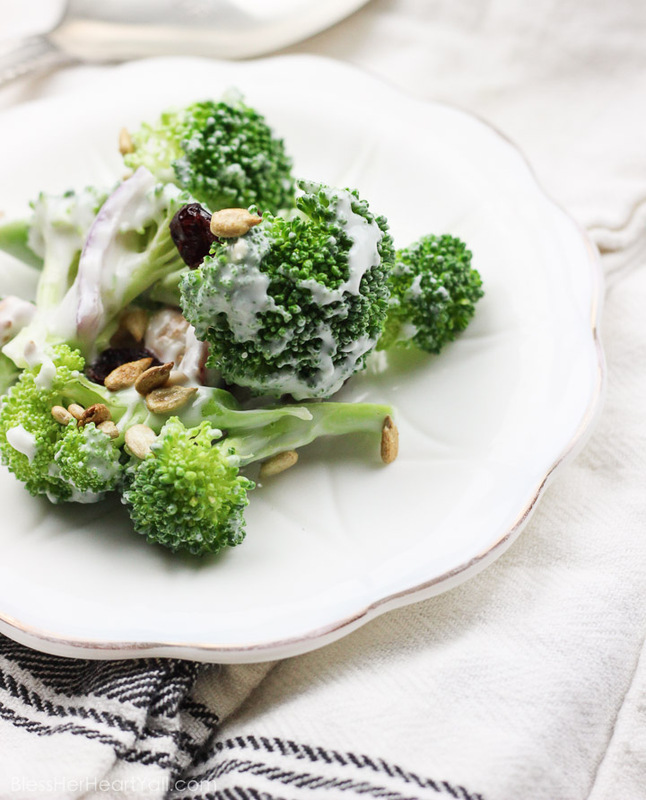 Skinny greek yogurt broccoli salad is a simple veggie dish that combines fresh broccoli florets, dried cranberries, thick-cut bacon crumbles, and a sweet creamy dressing made with greek yogurt! 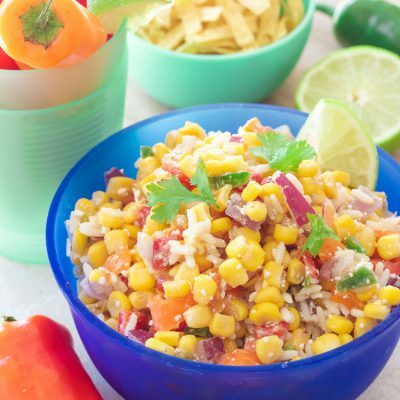 It’s the perfect healthy side dish for any meal! 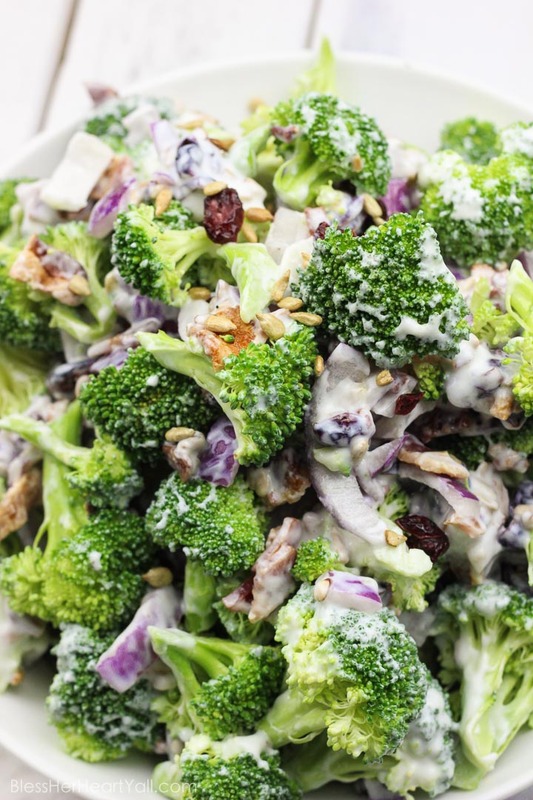 Skinny Greek Yogurt Broccoli Salad will help you ring in the new year right! I thought I would jump start some New Year’s resolutions with a skinny vegetable salad today that tastes delicious and not so skinny at all. Because I need some extra veggies in my life today….. because…. Now is the time to focus on healthy foods! 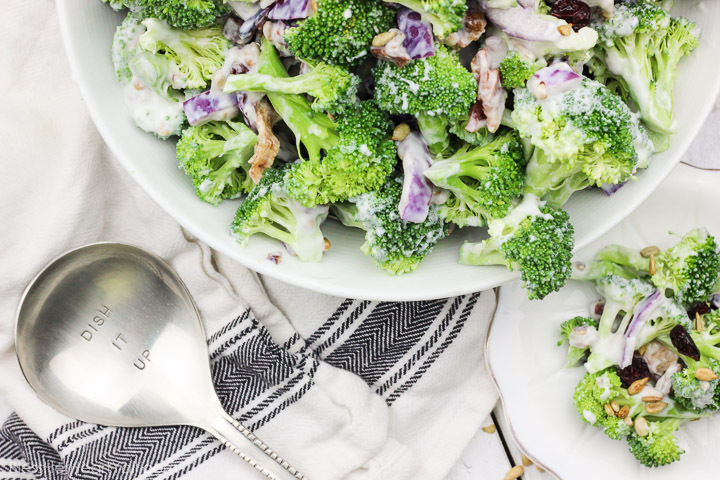 Speaking of healthy, skinny, delicious, and broccoli-ish… have you tried my healthy fall broccoli salad yet? I digress… Let’s get you on this delicious healthy broccoli salad train y’all! You’ve been missing out! Why have an amazing broccoli salad and then ruin it with an unhealthy dressing when you could easily make a sweet and creamy healthy dressing just as easily? This recipe replaces the mayo base in many typical broccoli salads and adds in nonfat greek yogurt in it’s place. So this means an increase in protein and cut in calories and fat. 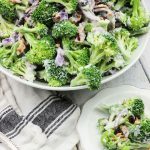 Once you add in the other ingredients to the lightened up dressing you will not be able to tell a difference and in fact, my family heavily prefers this skinny healthy broccoli salad version over any others. 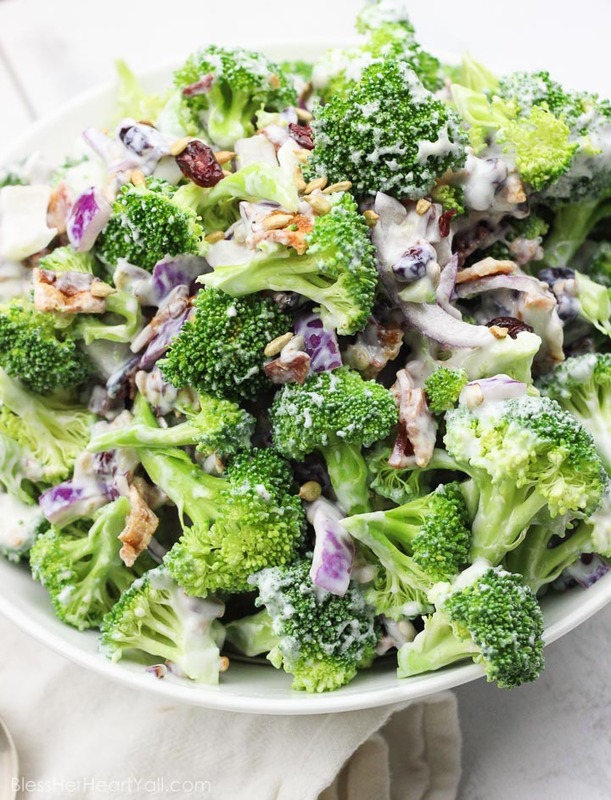 I combined fresh broccoli florets (full of fiber and vitamin C) with red onion slices, applewood smoked bacon crumbles, sunflower seeds (more fiber and protein) and chopped walnuts, dried cranberries, and the tastiest greek yogurt dressing. Obviously you can switch up the vegetables, seeds and/or nuts to your liking and the time of year that things are available to you. In a small mixing bowl, I combine greek yogurt, a small amount of raw sugars, and a splash of vinegar. The healthy dressing turns out to be a very creamy, light, sweet and refreshing sauce that goes perfectly with the other ingredients. And did I mention how quick (oh hey there 5 minutes!) and easy (oh hey there super easy!) this recipe is. I tell ya, this recipe’s a keeper! 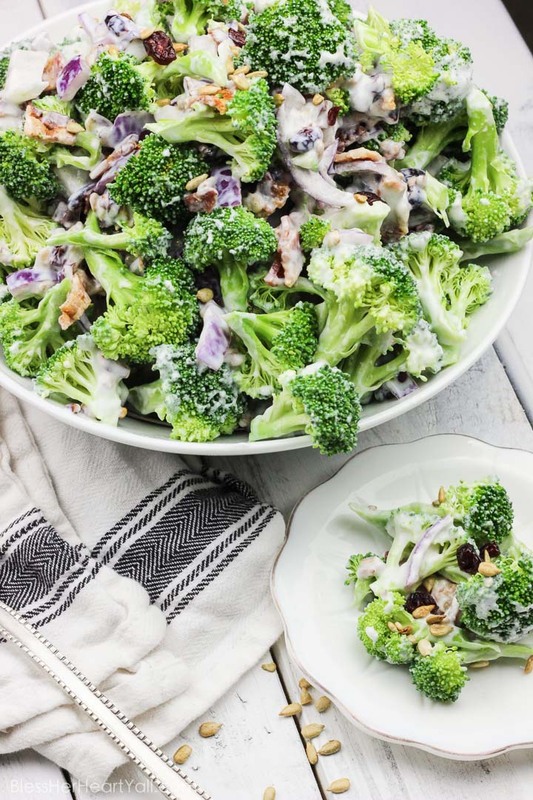 This skinny greek yogurt broccoli salad is a simple veggie dish that combines fresh broccoli florets, dried cranberries, thick-cut bacon crumbles, and a sweet creamy dressing made with greek yogurt! It's the perfect healthy side dish for any winter meal! 1/2 cup of walnuts or sunflower seeds or both! In a small mixing bowl, combine the greek yogurt, sugar, and vinegar together thoroughly. Set aside. In a larger bowl, add in the broccoli, onion, nuts or seeds, cranberries, and bacon. Drizzle the dressing over top the salad and toss until evenly coated. Enjoy! Any leftovers should be kept chilled in the refrigerator. I can’t wait to show you the rest of the month’s healthy/skinny/lightened-up recipes to help keep those healthy diet goals in check! If you have any requests for healthy dishes this month, contact me and I’ll see what yumminess I can come up with. And don’t forget to check out other famously delicious healthy recipes like the 5 Minute Greek Green Beans, Steak Salad with Chimichurri Dressing, and these Teriyaki Green Beans too. 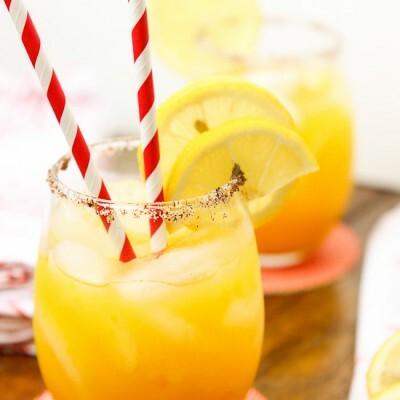 I really have to make this! Your recipes always look so delicious girl! 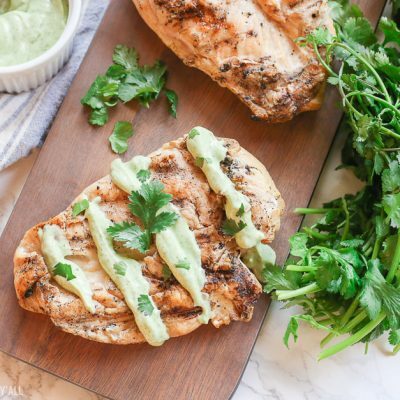 For someone like myself who isn’t much of a cook, I love easy and quick recipes! I really like the sunflower seed and cranberry call! You never see that. I love your unique stuff.